Posted on June 16, 2017 by Matthew Leib. This entry was posted in Faculty Friday, Spotlight and tagged Faculty Friday. Bookmark the permalink. We can learn a lot from the world’s worst villains—that is, if we only spare some sympathy to take a moment to see things their way. If that strikes you as an inflammatory suggestion, it’s supposed to be. For Ellwood Wiggins, assistant professor of Germanics at the University of Washington, it’s an essential exercise in exploring a question that has dogged moral philosophers for thousands of years: is compassion the foundation of human morality or an unreliable human impulse to be avoided at all costs? He explores the issue with students in his course, Sympathy for the Devil: The Rhetoric of Compassion, which examines how people try to elicit compassion—in other words: get people to feel sympathy for a given person or subject—across genre, time, and place. “In the history of thinking about sympathy, there are wildly different opinions,” Wiggins says. “Some think what makes people good is their ability to feel sympathy for others, while other moral philosophers think it’s a dangerous and unreliable emotion,” Wiggins says. 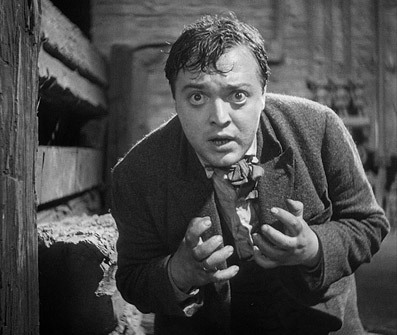 Peter Lorre stars in “M” as a serial killer being hunted by police and underground criminals. Wiggins uses the classic 1931 film directed by Fritz Lang as one of the lenses through which his class explores the rhetoric of compassion. Wiggins says rationalists like Spinoza and others saw the inherently erratic, emotional nature of feelings of pity, sympathy, and compassion as dangerous and destabilizing forces. This wasn’t because they were calculating, cold-hearted philosophers, rather, they believed acting on impulse could lead to unintended outcomes that could be just as morally undesirable—not to mention outcome ineffective—as refusing to act with compassion. Public figures, for example, will often employ pity or sympathy as a rhetorical means to serve their own ends, attempting to justify and legitimize policies or actions that affect millions of others by citing individual cases. It’s happened before, it happens today, and will happen again. “They start off with a speech in court; they write a theatrical scene; a first-person narrative, and then a visual component,” Wiggins says of the course’s core creative components, which correspond to four genre lenses—rhetoric, drama, prose narrative, and the visual arts. You might wonder why these figures deserve even a mote of sympathy or compassion—real, rhetorical, or otherwise. But for Wiggins, it’s this very quality of being “untouchable” that makes the axis of extreme evildoers the perfect foil for students seeking to understand the malleability of morality. In an age when hot takes, click bait, and round-the-clock updates have swirled together to create what often seems an unending cycle of moral outrage, Wiggins’ is a quest for a nuance where none exists and perspective when needed most. Half of the class’s readings draw on the work of moral philosophers ranging from Aristotle to Adam Smith to Hannah Arendt, while the other half consist of parallel readings in literature and film which serve as “experimental fields” for students to test each philosopher’s claims about the moral efficacy of compassion and sympathy. So what is sympathy, exactly? Adam Smith—better known in his lifetime for his work in moral philosophy than economics—defined it in his 1759 work, The Theory of Moral Sentiments, as feeling with the passions of others. “This feeling with one another—when we share empathy—that’s where all the good impetuses we have as human beings for each other come from,” Wiggins says. It’s something Wiggins experienced first hand as a 17-year-old exchange student in what had only recently ceased being East Germany. For the son of a Methodist minister and special education teacher from South Carolina’s low country who had never before left the South, the year living with a family in a little town near Leipzig proved the transformational experience of Wiggins’ life. These were the kinds of bonds of social connection Wiggins says people would often talk about in the South, but when he went to East Germany, he actually saw them in practice. He’d return to Germany years later to teach English at a German high school on a Fulbright fellowship. By that point, it was clear that literature as much as language had been a major link between his life in South Carolina to his lived experiences abroad. It was a seed of an idea Wiggins took back to the US after the fellowship ended. He spent the next year working as a stable hand on an historic rice plantation, awaiting placement in the Peace Corps. His mission landed him in the far east of Russia teaching English near the border with China at a teachers college in Birobidzhan, the administrative center of the Jewish Autonomous Oblast, which had been formed in the 1920s as part of an effort for national groups within the Soviet Union to pursue cultural autonomy in a socialist framework in which literature and the arts would replace religion as the primary expression of culture. His experience living and working on the far eastern fringe of a former empire would only last a year before Peace Corps missions were quietly, but decisively phased out under Vladimir Putin in the early 2000s. Wiggins subsequently returned to the U.S. and started grad school. He got an M.A. in eastern classics in Santa Fe, learning Sanskrit and reading Chinese classics in translation. The farther he delved into comparative literature, the more he found himself examining his long-held belief that art can be a fundamental force for good. “The more I thought about, read, considered, and even observed myself as I read, the more suspicious I became about how that works,” he says. In searching for answers, Wiggins found something of a kindred spirit in 18th-century German critic and playwright Gotthold Ephraim Lessing, a controversial figure in his day. As one of compassion’s champions, Lessing figures prominently in Wiggins’ syllabus for The Rhetoric of Compassion. Even so, there’s still a lot of learning to do. Ellwood Wiggins holds a B.A., Philosophy/Liberal Arts from St. John’s College, an M.A. in Eastern Classics from St. John’s College, Santa Fe, an M.A. in German from The Johns Hopkins University, and a Ph.D. in German from Yale University. 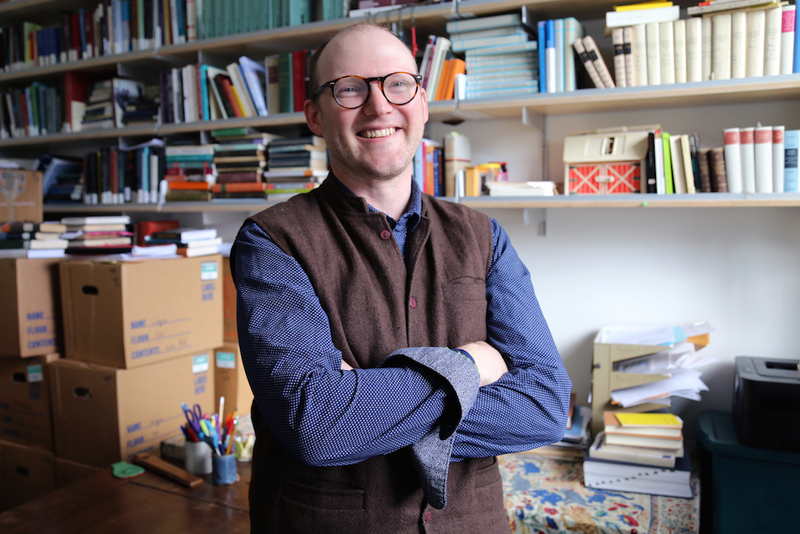 His first book, Odysseys of Recognition: Performing Inter-Subjectivity in Homer, Aristotle, Shakespeare, Goethe, and Kleist, examines recognition scenes in literature from antiquity to modernity and is due out in 2018. Sympathy for the Devil: The Rhetoric of Compassion will be offered again this coming Fall quarter.